This calculator and conversion scale will convert the height or depth of a fluid in any units to a measurement of hydrostatic head pressure, and display a list of conversion values above and below the entered liquid level. Enter the measured liquid depth to, or the height of fluid from a point at which the hydrostatic pressure is to be calculated. Enter here the ratio of liquid density compared to the density of fresh water (1000 kg/m3). The default value is set to an SG of 1.00, which corresponds to fresh water at 4 degrees Celsius. Enter the acceleration due to gravity for your geographical location in metres per second per second (ms-2). The local gravity is dependent on several factors such as latitude, height above sea-level, local geological density, etc… Refer to your national geological survey data for your location or use this local gravity calculator to determine a close approximation. The default value is set to 9.80665 ms-2 which is standard gravity. 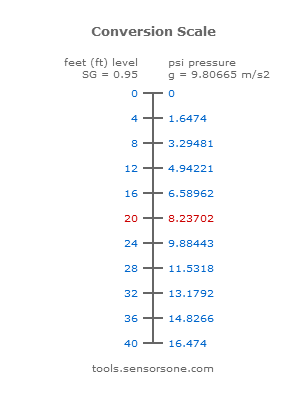 This is the calculated head pressure expected from the entered values for liquid level, specific gravity and local gravity. The calculation determines the difference in pressure between the bottom of the liquid column and the surface of the liquid, therefore it excludes any pressure contribution from air or a gas on the surface. How would I determine the pressure range required to measure a 40′ deep diesel storage tank? To determine the pressure generated by a 40 feet of Diesel, you will need to know the specific gravity (S.G.). The S.G. of Diesel varies depending on temperature and diesel type, but 0.95 is the maximum often indicated by many resources. Using this calculator a 40 foot column of Diesel would convert to 16.474 psi. What is the formula to calculate liquid pressure on bottom of a circular tank? The pressure is directly related to the height of fluid and is independent of tank shape, so you would use the formula above. In the conversion of liquid level to pressure, why is there no consideration for the area or diameter of the tank? 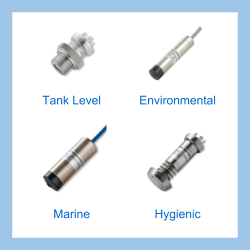 Liquid level is directly proportional to hydrostatic pressure, so there are no other dimensions that need to be considered when converting liquid level to pressure. Area or diameter do not affect liquid level, but they do affect the liquid contents & volume measurement such as in a horizontal cylinder tank. Send us your enquiry for a product associated with this Liquid Depth/Level to Hydrostatic Pressure Calculator page, and get assistance with selecting a product for your application.